My dance journey began at the age of 6 years old. I started with ballet, but despite my natural abilities I wanted to quit within months. At that time I would have rather been playing outside somewhere with my friends (the good ol’ 90’s! ), but my mom wouldn’t allow me to discontinue until I performed in the spring recital. She always taught me not to quit something until I saw it all the way through, to finish what I committed to. We arrived at the recital only for me to see and hear tap dancing for the very first time. Immediately I was captivated. I looked up at my mom and said “Mama, I want to make that sound”. Barbara Hammond’s School of Dance is where I started taking dance, and is where I truly learned how to perform. During my time there I competed in dance, going for titles and gaining many performance opportunities. During my high school years I also trained with Henrico High School’s Center for the Arts Program. This opened my eyes to a whole new world of dance. I was educated in modern dance and choreography and quickly developed an equal love for this style of dance. At this point, I thought I wanted to go to college for dance, but I wasn’t totally sold. Not until something pretty tragic happened; I had a cheerleading accident and fractured my spine. I had to wear a full-on back brace for about 5 months, putting me out of dance for the first half of the school year. As I sat, watched and took notes during all of my dance classes, a passion stirred in me for dance like I was craving it for the first time. Sometimes we can get complacent and comfortable, and then sometimes we get knocked out of that place only to appreciate it more. It was at that time I knew, without a doubt, that I wanted to go to college for dance. I went on to earn a Bachelor of Fine Arts in Dance and Choreography from Virginia Commonwealth University. During my time at VCU I performed in works by choreographers Christian von Howard, Martha Curtis, Melanie Richards, Autumn Eckman, and numerous student works throughout my duration at VCU Dance. These studies sharpened and shaped what was a love for dance to a life calling and career. This was also a “coming out of my shell” experience as I overcame a lot of fear in my life. I am grateful for every mentor and friend I had on this journey. I have had the privilege of working with the Richmond Symphony, performing a tap and a jazz number at the Carpenter Center. I performed “Sowing Shadows”, choreographed by Rachel Rinehardt for the 2015 VCU Dance Alumni Concert. In 2016 my piece “Temporary Blindness” was performed in the RVA Dance Festival at Dogtown Dance Theatre. In 2017 I performed in a tap piece in The Sixth Annual Elby Awards hosted by Richmond Magazine and I performed in Karar Dance Company’s Inaugural Performance. In 2017 and in 2018 I performed in Richmond Urban Dance’s I Am Hip-Hop Shows with RVA Tap Troupe. I am blessed to have had all of these performance opportunities! After a season of dancing in New York, I traveled to France, England, Germany and India. My time in India was especially expressive of how I want to pursue dance in this stage of my life. Our hope was to touch the hearts of the people in Hyderabad using the vehicle of performance. We prepared for months prior to leaving for a performance we put on for three different churches. I was honored to choreograph and perform in the show that moved people’s hearts in a way they hadn’t felt before. The performance was called “The Master’s Plan” and it told the story of the life and ministry of Jesus Christ. It is an experience I will never forget. 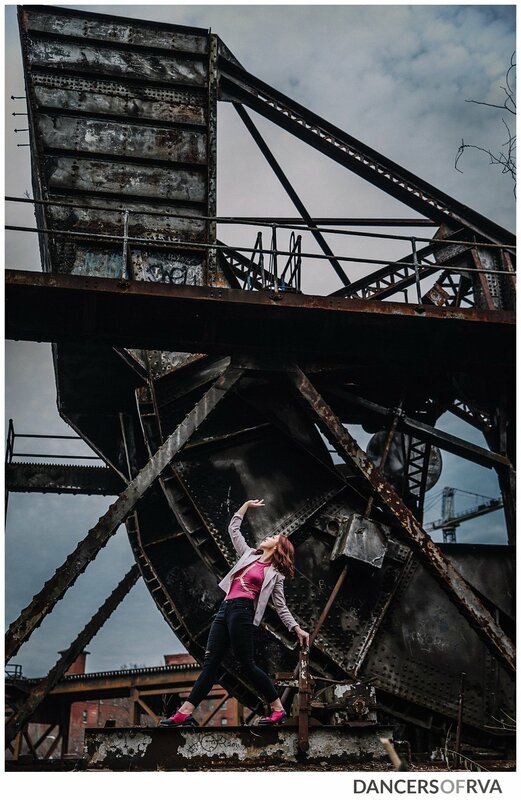 I currently live in Richmond, where I am teaching at Barbara Hammond’s School of Dance, Passion Academy, guest teaching at Henrico High School’s Center for the Arts, and guest teaching for Richmond Urban Dance. I also substitute teach for many studios in the Richmond area. This past fall I choreographed and performed in “Glorious Christmas Nights”, the annual Christmas production presented by West End Assembly of God, viewed by about 22,000 people per year. I also perform in companies RVA Tap Troupe and KARAR Dance Company when time allows. I am excited to begin collaborating with local musicians to pursue dreams I’ve had for a while. Stay tuned folks! I chose Great Shiplock Park because it’s a location for transportation. I absolutely love to travel, so of course I was drawn to the longstanding railroad tracks. 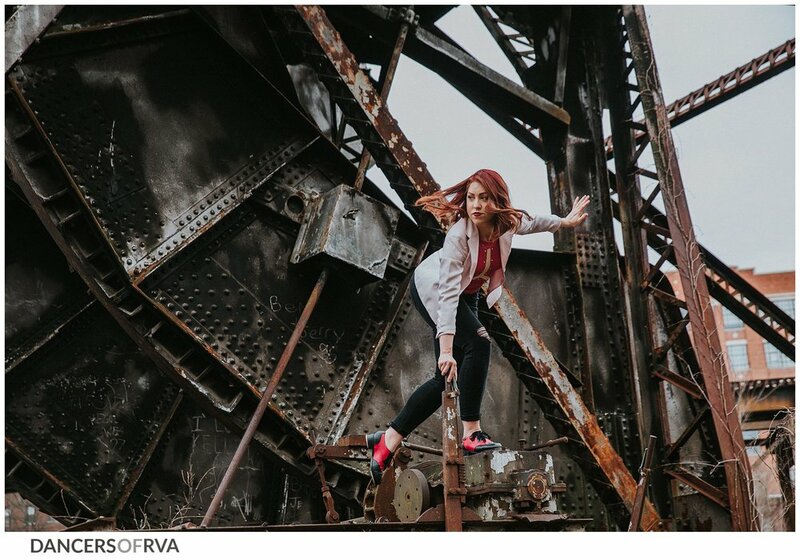 RVA is known for it’s canals and railroads, so this seemed like a perfect spot. On the way to the second location (Main Street Station), Kat saw a charming little spot for a spontaneous shoot! The beautiful old painting on the brick wall and the worn down windows matched flawlessly with the color of my dress. I love how spur-of-the-moment art can be! When we arrived to Main Street Station we discovered they were having an event, which meant we couldn’t do the shoot. It’s a good thing we made our little pit stop! This was a special and unique opportunity, and I’m grateful this was my experience.